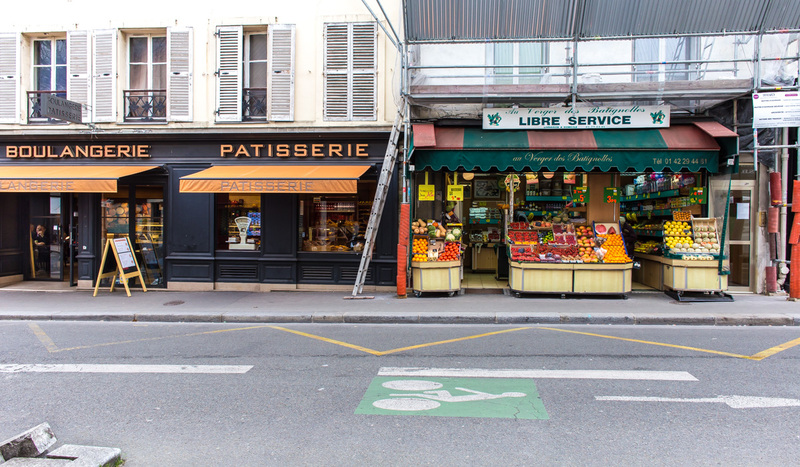 As in most Parisian neighborhoods, Batignolles has many of the essentials: small grocers, bakeries, and cafés. I walked past this produce store, open for business early Saturday morning. Next door, on the corner, was a bakery and pastry shop which also had a few tables inside for coffee. Look at all that produce! The store is called "Au Verger des Batignolles" (The Batignolles Orchard). One thing I didn't photograph was the proliferation of neighborhood groceries that are part of the large national chains of super- and hyper-markets. Examples of these are Monop' (Monoprix), Carrefour City and Carrefour Market (Carrefour), U Express (Super U), Intermarché Express (Intermarché). There are others like Franprix and Casino which are also part of large conglomerates. There's a lot of overlap; it wouldn't surprise me to find out that they're all owned by the same corporation (I'm only half kidding). These shiny new stores are colorful and inviting. Back in the early '80s, I remember the neighborhood store chains like Prisunic, Uniprix, and Félx Potin, but they're mostly gone now. Aside from the big chains, there are also probably hundreds of small, independently owned and operated grocers in the city. I'm really enjoying this walking tour. We've got a year-round "French crepes" kiosk on the paseo that looked just like that bouleangerie until they painted it this year! Is "libre service" what we'd call self-service? I like the clearly marked bike lane on the roadway. I get the impression the French 'buy local' and they don't have any of the nasty 'chain' stores so common here in the states? judy, I don't remember that one... thanks! emm, I think it is. You don't have to wait to be waited on. michael, oh yes they do. Grocery chains, restaurant chains, including McDonald's and Starbucks.